One of the hottest products for your holiday gift guide is the POWER RANGERS MEGAFORCE. Kids would love to get their hands on action figures, bike, games, clothes, scooter and more. Both of our kids love the Power Rangers. They watch episodes on television everyday. Our kids enjoy the show. They can act like a Power Rangers by play fighting. It all about the kids having fun! 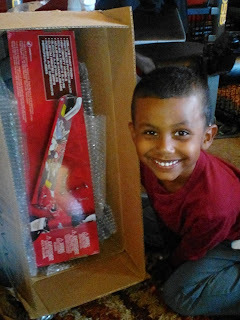 Saban Brands sent us one of their POWER RANGERS MEGAFORCE Aluminum Scooter. 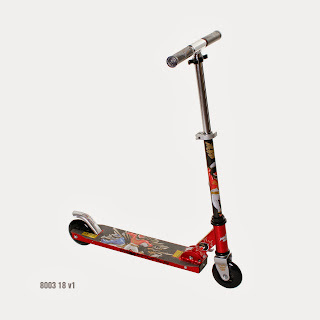 The scooter is for kids ages 5+. Our son came home from school and saw the box. 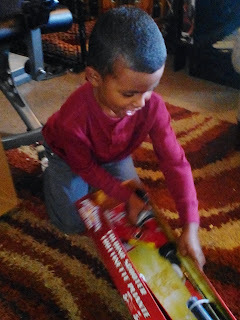 He opened it up and was so excited to get the scooter. He couldn't wait to open it up. It makes us happy to see him smile. He took the scooter and started riding it around the house. I pulled the locking lever up to open the scooter. The handle bars have to be put in and holds in place. It's great to fold and put away when not in use. POWER RANGERS MEGAFORCE Aluminum Scooter Giveaway Event is hosted by NY MOMSTYLE. One lucky winner will win a POWER RANGERS MEGAFORCE Aluminum Scooter. This giveaway is open to US only and 18+ and ends 12/21/2013. View products from POWER RANGERS or buy visit http://shop.powerrangers.com/. We recommend the scooter is great Christmas gift and for birthdays. The POWER RANGERS MEGAFORCE Aluminum Scooter retails for $39.99. To buy a POWER RANGERS MEGAFORCE Aluminum Scooter visit Toysrus. CONNECT WITH POWER RANGERS: Like POWER RANGERS on Facebook and follow them on Twitter for promotions and more.